Corey Schlicher drives Bigfoot 8 onto a vehicle outside McLane Stadium to announce plans for the “No Limits Monster Truck World Championship” scheduled May 2. 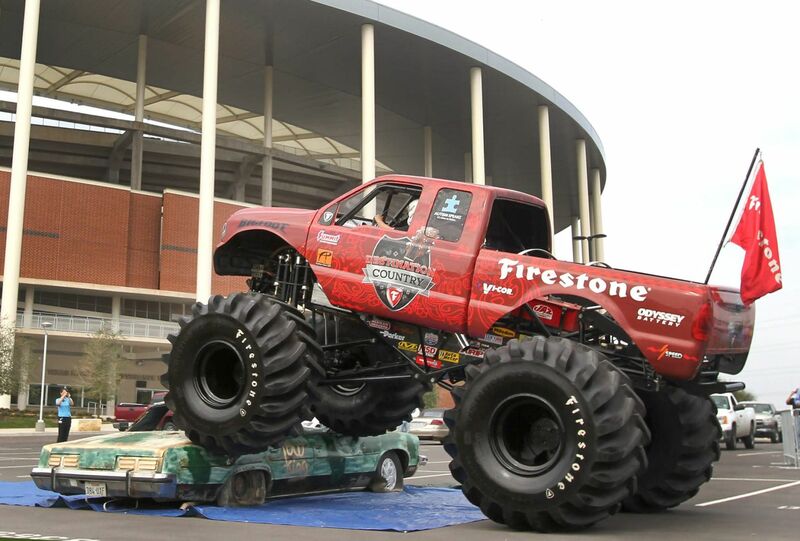 The “No Limits Monster Truck World Championship” will rumble into McLane Stadium on May 2, bringing with it the legendary “Bigfoot,” driven by Dan Runte. That announcement came Tuesday morning in the parking lot of Baylor University’s new football complex, where a monster truck mashed a junked car and sat atop it for photographs. The event’s lineup, created by Fort Worth-based Checkered Flag Productions, will include racing, a wheelie contest and a freestyle car-crushing contest. Other drivers scheduled to attend will be 2013-14 National Champion Larry Quick driving “Ghost Ryder,” 2012 World Champion Jimmy Kohler driving “Avenge,” Dawn Creten driving “Scarlet Bandit” and 2005 World Champion Jimmy Creten driving “Bounty Hunter.” BIG Ed Beckley, owner of Checkered Flag Productions, said he will attempt a motorcycle jump over 10 semitrucks parked side by side with his custom built BTR Harley-Davidson Motorcycle. Tickets will go on sale soon, and officials said they do not yet have a price range established. “We are thrilled to welcome monster trucks to McLane Stadium. This is one of the events that is most requested, and we anticipate this will be a great evening for the citizens of Central Texas,” said Scott Neal, general manager of SMG, a venue-management company hired to put on private and public events at the $266 million stadium. Neal said dump trucks will haul in nearly 9,000 yards of dirt to protect McLane Stadium’s playing surface during the truck event. Community and university officials have said they want to make McLane Stadium a community draw that includes year-round activities such as tractor pulls, truck rallies, cook-offs, high school games and big concerts. Neal said a monster truck event “is something people have been talking to me about for months.” Beckley said his Checkered Flag Productions takes part in about 40 events per year, and he couldn’t resist the invitation to help christen McLane Stadium. He reportedly worked with Neal on another event about 6 years ago in Salt Lake City, and the two touched base again when Neal began promoting Baylor’s new facility. “We’re always drawn to new stadiums, and that place is beautiful,” said Tina Kelly, event director for Checkered Flag Productions. Bigfoot, so named because of its huge tires, will star in next spring’s show. It was introduced in 1979 and is considered the original monster truck. Through the years, the industry has taken to identifying the latest version on the circuit by number, and Bigfoot 8 made the visit to Waco on Tuesday. “I don’t know exactly which number will be featured next May, but I know it will be one of the more noteworthy ones,” Kelly said. Dan Runte, who will be driving the BIGFOOT in Waco, set the world monster truck long-jump record on Sept. 11, 1999, in Smyrna, Tennessee, driving Bigfoot 14. He jumped the truck a total of 202 feet, clearing a 727 jetliner in the process, according to reports on the history of Bigfoot.